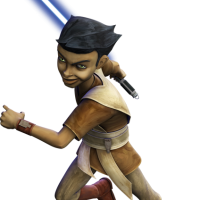 Petro was a Human male Jedi Youngling who served the Jedi Order during the Clone Wars. Medium to light brown and short sleeved. Tunic should be long enough to cover buttock and crotch area but no longer than upper thigh. Mid thigh would be too long. Tunic is a solid piece with no seam down the front. Neckline has a small “V” at the front. Tabard is one piece vest style in the back with a “notch” at the neck line. In the front, the tabards are two pieces that are no wider than the shoulder. The tabards should fall in front a couple of inches past the hem of the outer tunic. The tabard color should be an ecru/natural/very light tan color. Traditional sash/obi in construction and should be the same color as the tabards. Width of the sash should be about 1-2” (2.5 to 5 cm) above and below the belt dependent on the size of the wearer. Pants are light to medium tan. Pants should be darker in color than the tabards and sash. No pockets or ornamentation of any kind. Plain and unadorned. Could be made from leather or a heavy and smooth fabric. Belt should be the same color as the pants. D-Ring style clip attached to the belt. Wider at the top with two rivets holding it to the belt. Clip tapers to a hook at the bottom. Clip should fall no longer than the hem on the sash/obi. Wrist com unit should feature a leather cuff about 3” (7.5 cm) wide with the unique ornamentation of the character. Color of the wristband/wristcom should be a medium brown and match the boots. Lightsaber can be hilt only and should either be a “hero” lightsaber to match the saber carried by the character. Lightsaber can also be any custom made NON ICONIC (non face character) hilt. If bladed, the blade color should be blue. Hair should be cropped short and dark brown/black in color. Wig can be worn.